Nightmare on Chicago Street: The City of Elgin's signature Halloween event returns to downtown Elgin on Saturday, October 21 from 6:00-11:00 p.m. More than 15,000 citizens gathered last year in the NOCS Safe Zone, which features three stages of live music and entertainment, Cirq d' Freak show, zombie dance crews, post-apocalpytic battles in the Thunderdome, food and drink vendors, costume contest and much more. Tickets and V.I.P. Parking packages are available online at www.nightmareonchicagostreet.com. The Elgin Area Chamber will also have tickets available at our office Monday-Friday from 9am-5pm. Advanced tickets are $12 each. Call to the Hall: The Elgin Sports Hall of Fame Foundation has selected former athletes and coaches Jennifer Haley, Dave Huxtable, Jessie Henderson, Bob Pleticha and Bethany Goldsmith for induction to the Hall of Fame, which takes place on Sunday, November 5 at the 37th annual induction ceremony and banquet at The Centre of Elgin. Dennis DeBoer will also posthumously receive the organization's Vic Masi Award. $1M Grand Victoria Casino renovations: The next time you visit the Grand Victoria Casino you may notice some exciting new renovations to their banquet facilities. The new Victoria Ballroom has a brand new bar and solar efficient BBQ area on the patio while the Grand Ballroom enjoys new chandeliers, beautiful new wall treatments and carpeting and increased space for a dance floor at events. The renovations should increase business for banquets and meetings at the casino. Imagine Art Here: Three artists were selected in Elgin's first public art contest. Joanna White of Countryside was selected to paint a mural on the south side of the Hemmens Cultural Center, while Davis McCarty of Chicago and Nathan Pierce of Missouri will create sculptures to be displayed along the Riverside Drive Promenade. All three pieces will be unveiled at the Cultural Arts Commission's Art Harvest on Saturday, October 28. 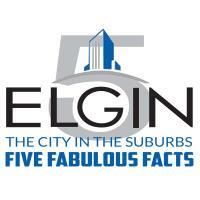 Take the Pledge: In September, Mayor Dave Kaptain read a proclamation for Elgin Monarch Day. He encourages local residents to take the Mayor's Monarch Pledge as well by planting milkweed in their yards this fall to help save monarch butterflies and other useful polinators.